If imitation is the sincerest form of flattery, then I think Noodlecake and Massive Damage have just written a crown of sonnets to Candy Crush Saga (Free) publisher King. Like one of its previous releases, Flappy Golf (Free), Noodlecake’s latest release, Zombie Puzzle Panic (Free), is a reply to one of the biggest hits of the App Store. While that game took the main mechanic from Flappy Bird and gave it an excellent twist to create something new, Zombie Puzzle Panic is altogether less exciting and almost cynical in its fairly strict adherence to Candy Crush Saga‘s gameplay. One might say King has earned this, but whatever your feelings are about that company, the result in this case is a game that is almost exactly like Candy Crush, but a little bit worse. Zombie Puzzle Panic is a match-3 game with a zombie flavor, which I imagine tastes like rotten meat and decaying civilization. If you have ever played Candy Crush, this game is going to be very familiar, and not just in that usual “they all copied Bejeweled" way. You play through various stages trying to reach the goal on each one. That goal varies from stage to stage. 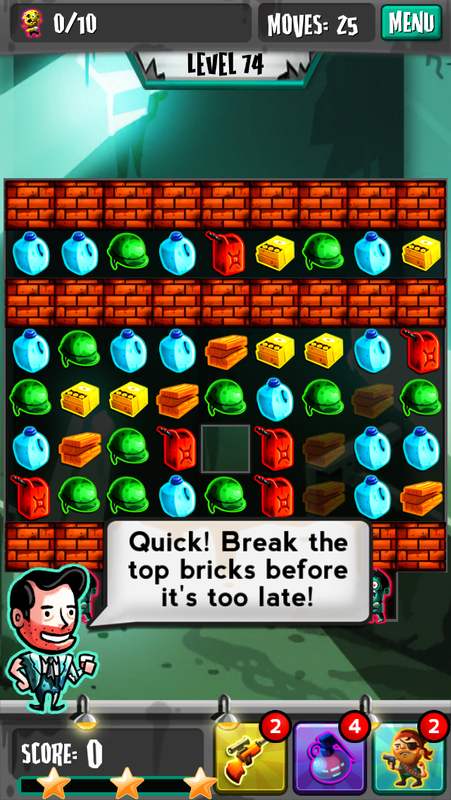 You’ll see the exact same type of goals that you would in Candy Crush, including reaching a certain score within a particular amount of turns or time, clearing slime off of blocks by matching on top of them, clearing a path for survivors to reach the bottom of the screen, or collecting a number of pieces of a specific type. In addition, there are a few goals not found in Candy Crush that come about naturally from the theme, like killing a set amount of zombies or preventing the zombies from killing any scientists. 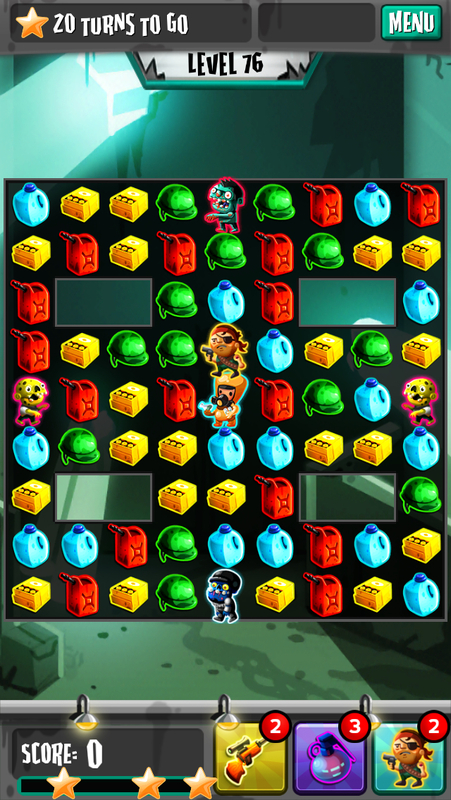 The gameplay itself works like just about any puzzle game from the Bejeweled mold. Matching three or more pieces of the same type clears them from the board, causing more pieces to fall from the top. If you match four pieces, you receive a special piece (a striped version of that piece, not even subtle) that when matched will clear out a full line vertically or horizontally. If you match five pieces in a T or L-shape, you’ll get a piece that clears the area immediately around it, bomb-style. Finally, if you manage to match up five of the same pieces in a straight line, you’ll receive a grenade which can be matched with any other piece to clear all of the pieces of that type from the board. If you match special pieces with each other, you’ll get some pretty powerful effects which again mirror the combos from Candy Crush. Adding to the chaos is the presence of zombies, scientists, and guards. Zombies come in a few different types, with some of them being a minor annoyance while others behave like sentient Candy Crush chocolate, gumming up the board and becoming a bigger problem the longer you let them go. Generally, the biggest threat they pose is to any scientists or survivors that might be populating the board. If a zombie touches a human, they’ll kill them and leave a marked block behind that can only be removed by matching something beside it. If a scientist dies, it’s usually the end of the stage, while if a survivor or guard dies, you can carry on, albeit with a handicap. Scientists and guards aren’t subject to the board’s gravity, but you can move them around freely, one square at a time, to try to get them out of harm’s way. Naturally, guards aren’t defenseless, and will shoot at any nearby zombie if they have their guns loaded, but they’re rarely seen as you play through the game unless you plant one down yourself using one of the game’s power-ups. Zombie Puzzle Panic of course features power-ups just like Candy Crush, and with the exception of the guard, they are similar in function. You can buy them using a premium currency, but in one of the few things I feel this game does better than its inspiration, you can earn them by scoring three stars on a stage. Incentive to score three stars on stages and a way to get power-ups without shelling out a ridiculous amount of money? I’m spoiled here. There is one minor catch, however. You have a limited inventory, and if there’s no room in your bag, you can either expand your bag by paying some premium currency or watch as your hard-earned power-up gets thrown away forever. The lesson here is to use them or lose them, I guess. In addition to buying power-ups or expanding your bag, you can also use your premium currency to buy a last chance in case of failing a stage, giving you a few more moves or seconds to try to achieve your goal. In another pleasant turn, instead of buying a continue with premium currency, you can opt to watch an ad, and you can do this as many times as the ads hold out for you. You can also watch ads whenever you want to earn a single coin of premium currency, which is kind of cheap, but better than nothing. It’s a good thing this system is in place, though, because this game effectively shows off what King does better than the rest. In King’s games, it always feels like you’re just one or two turns away from clearing the stage, something that strongly tempts you to take that continue option. In Zombie Puzzle Panic, you’ll usually find yourself either blowing out the stage completely or ending up well short. There were stages where I had to continue four or five times just to have a chance to get through. It’s not horrible overall, but the balance just isn’t there the way it is in King’s games. There’s also a familiar lives system in place, where failing a stage costs you a life, and running out of lives means you either pay or wait. I almost never ran out of lives and the few times I did, I had to wait for more ads to show up anyway so I could use the continue feature if I needed it. 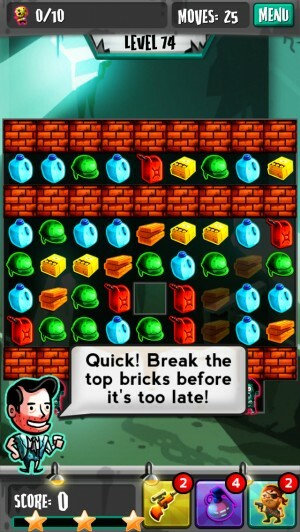 Zombie Puzzle Panic is a very polished clone of Candy Crush Saga that has a few of its own ideas, but still ends up feeling almost exactly like the target of its flattery. It has a better art style and it’s certainly more fair to the player in general, but the inconsistent balance and overall lack of differentiating factors make this a hard sell for Candy Crush fans, while the heavy similarities to that game are likely going to put off everyone else. Unless this is all one brilliant meta-commentary on how match-3 games and zombie themes are overdone, in which case, well-played, Noodlecake and Massive Damage.